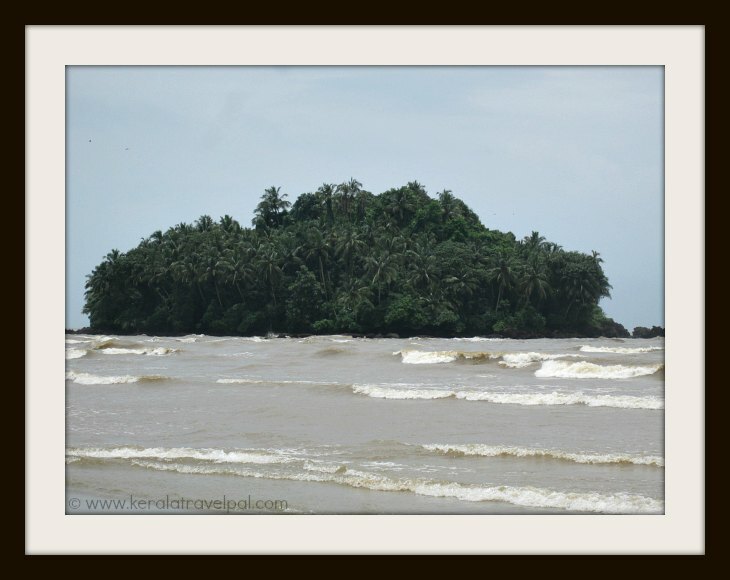 Dharmadam Island in Kannur, is a secluded getaway spot, beautifully green with coconut palms and wild bushes. No wonder locals call this tiny 5 acre islet green island. During low tide the ocean recedes making it possible for visitors to walk to the island. 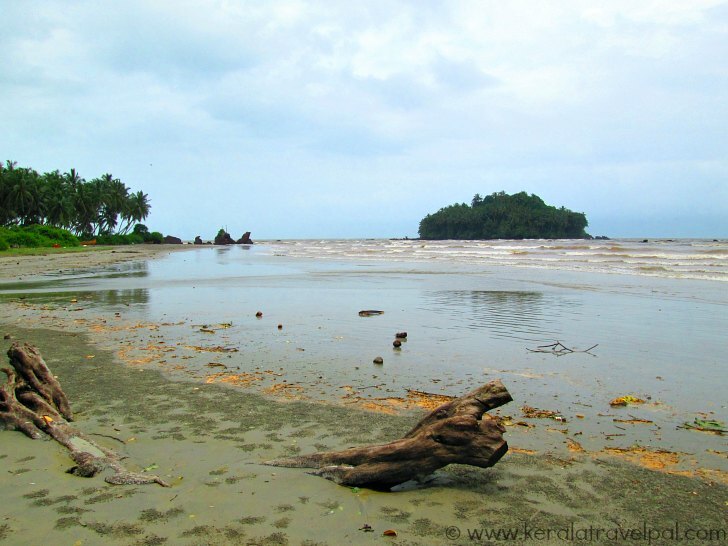 Walking through less than knee deep water and reaching the Island is an exciting experience. Make sure to return before the tides get stronger. Alternatively, you can take a boat from south end of nearby Moidu Bridge located along Kannur - Thalasseri highway and reach Dharmadam Island. The island uninhabited, even though a well is seen, indicating human presence. There are medicinal herbs and some interesting plants on the Island. Dharmadam Island used to be privately owned. Realizing its tourism potential, Kerala government took over the Island some years ago. have you heard about the drive-in-beach in Kannur? Yes, you can drive your car in the sand, alongside waves. And beach driving there, oh my, is it popular! Dharmadam Island is located just about 200 metres away from Muzhuppilangad drive-in-beach. It is the only drive in beach in Kerala, and one of the best in India. Dharmadam-Muzhuppilangad coastal belt is getting more and more popular as word is spreading about the fine drive in beach and the nearby island. The area, considered along with the best beaches in Kerala, has witnessed a steady increase of foreign tourists since late 90’s. Due to the areas significance, Dharmadam now seats a railway station. Local passenger trains stop there. Once an area frequented by Buddhist monks from North India, Dharmadam means the place of ethics. Far from the days of Monks, the fulfilling place is an ideal spot for romance. With its serene unspoiled charm, it is a great locale to include in Kannur honeymoon tours. The blue sea, the emerald island, the beautiful green villages, the vast stretch of sand, the black rocks peeping up from the sea.......a place to relax and unwind. Dharmadam island in Kerala is a great picnic spot and weekend getaway. Heritage of this place is not limited to monks. Jews and Arabs had connections to Dharmadam. Their records of 12th century indicate Dharmadam as Dahfattan. Slighly different variations of the name were used by British and Portuguese, whose paths also came across with Dharmadam. Another attraction at Dharmadam village is Andalur Kaavu. It is a Hindu religious place popular with locals. A Kaavu is a small preserved forest usually a serpent grove. Dedicated to snakes, Kaavus are places where they are worshiped. Kavuus form a natural habitat to diverse kinds of snakes, where they are left undisturbed. Similar to most Kerala Villages, Dharmadam has its own festival. During the week long festival, held in February, villagers restrict themselves to a vegetarian diet. The tradition also includes offering rice flakes and dishes to guests. Theyyams, the local art form, is performed during the festival, which draws thousands of people from far and near. Coming from Kannur and Thalasseri, travel to Dharmadam Island is rather easy. Private buses from Kannur and Thalasseri stop at the Dharmadam main land. If you are taking a long distance limited stop bus, such as Kannur-Kozhikode service, check with the bus staff before hand, if they stop at Dharmadam. You can also hire taxi or auto rickshaw from either Kannur or the nearby Thalasseri town. Accommodation Options : No accommodations at Dharmadam. Hotels and lodges at Kannur and Thalasseri. Nearby Attractions : Muzhappilangad drive-in-beach, Andalur Kaavu,Thalasseri fort, Arakkal Museum, Meenkunnu Beach, Mappila bay, Kannur town( shpopping & food), Payyambalam beach and Sea View Park.